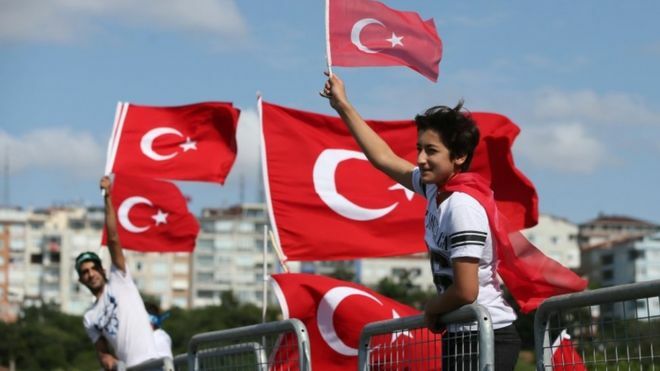 Turkey is holding a series of events to mark the first anniversary of a failed coup in which at least 260 people died and 2,196 were wounded. President Recep Tayyip Erdogan will unveil a memorial on an Istanbul bridge that became a landmark of resistance and will later address parliament. An army faction tried to seize power last July but the attempt collapsed. The government has since dismissed more than 150,000 state employees, saying it is rooting out coup supporters. Kicking off a series of events that will extend into dawn on Sunday, Prime Minister Binali Yildirim told a special session of parliament that 15 July 2016 was a "second War of Independence", following the conflict that led to the creation of the modern state in the 1920s. "It has been exactly one year since Turkey's darkest and longest night was transformed into a bright day, since an enemy occupation turned into the people's legend," Mr Yildirim said. Huge rallies are to take place on Saturday, with 15 July declared an annual holiday. Mr Erdogan will attend a rally in Istanbul on the bridge across the Bosphorus where crowds confronted soldiers. It has been renamed the Bridge of the Martyrs of July 15 and the president will unveil a "martyrs' memorial" there.